Have I just seen the end of America? Getting ready to see the last space shuttle launch event must be lot like what a pregnant woman feels going into labour; a lot of agony for a few seconds of fun. And fun it was, including the agony, I guess. For our part going to see the last shuttle launch was a bit of a whim. Our oldest boy loves astronomy and all things space-related, so that was enough of an excuse. So we packed up into the van for the 30-plus-hour drive to Cape Canaveral. Along the way we got to see what’s left of America after the great financial crash of 2008. The all-night radio was full of news on the jobless rate in the U.S., now at something like 9.1 percent, and the stalled growth in hiring, sputtering along at only 18,000 new jobs last month. The eeriest part of this was the deserted freeways in northern New England on July 4th. Obviously, vacationers were not travelling in droves to spend their money. When we stopped in Massachusetts at a pretty—and normally very busy—historic inn it wasn’t even half full. The great thing about this was the customer service. The desk clerks and waitresses treated us royally. By the time we got to New York City and Long Island the effect had worn off. A late night gas fill-up in a seedy southern neighbourhood in Queens was, well, a bit scary. Since my credit card didn’t have a zip code attached, I had to go inside and deal with the locals: a couple of toughs in sleeveless T-shirts and an even tougher clerk, an unshaven Middle Easterner with bad skin in a hoodie. This was on the way back from maybe the best (or second best) beach in North America near the tony town of Westhampton Beach. Once you find the beach the homes lining the waterfront are wonderful, all architecturally designed and strategically placed facing the sunset on large lots. And the surf crashes up mist in the fading sunlight along a sandy beach that must stretch along 10 miles of coast. Very, very nice. Back in the van, Barack Obama was on the radio trying to cut a deal with the leaders of Congress and the Senate to get some kind of agreement on America’s budget that would cut the national debt by $4 trillion in a decade. And time is not on his side, or I should say, America’s side, as the country is poised to default on its national debt in two weeks if there’s no deal on the table. That’s rather bleak news. The big choices are either cutting social services such as Medicare, or raising taxes. But I had to wonder, to whom does America owe this money? To the big banks they just bailed out? Or to investors in the bond market? Turns out they owe the money to pretty much everyone, including some of their own departments and, of course, the Chinese. And Obama has a big job on his hands. Since Jimmy Carter, who brought the debt down to its lowest levels in a century and Clinton who tried, the Republicans who preceded him: Reagan, Bush I and Bush II have spent the country into a debt of coma-inducing proportions. Which is odd, considering that these arch-conservatives all achieved power by professing to have some understanding of finance. Well, I guess. Another item in the American news was obesity. Apparently it’s still growing. And, yes, we’ve seen a lot of evidence of it as we’ve travelled south. Given the dire financial straits in the U.S. one would think that people would be eating less, not more. But fat doesn’t work that way, unfortunately. When times are tough the poor tend to eat more cheap carbohydrates, and that means building more fat. So even when they’re gaining they’re losing. And then there’s TV. I always go into television shock on road trips, but this one was particularly bad. Every news network was obsessed with the “tot mom” acquittal. The jury found Casey Anthony not guilty of murdering her young daughter. In between news bites I watched ads for reverse mortgages, memory foam mattresses and stair climbing machines, all clear signs of an aging America, which was also on the news. And even the Mexicans seem to be less interested in illegally crossing the U.S. border to find jobs. Things may actually be looking better for them at home. I guess that’s a real sign of the times. But is this the end of America, I mean the end of financial dominance, the end of social dominance, the end of technical dominance in space? I don’t know. I noticed that the natives were friendly as we passed through the Carolinas and Georgia—just before we entered the torrential rains of east coast Florida. The weather got so bad that the van’s electronics crapped out from all the water. The alternator probably got doused. But after a half-hour of waiting in the suffocating, humid heat inside the van for the engine bits to dry out, the dashboard warning light went out and we were on our way—to find a hotel. We hadn’t booked ahead and apparently neither had a lot of others. We were cruising to find a hotel room along with literally another million people. We managed to find a great room an hour away in Orlando (of Disney World fame), which always seems to have tourist capacity in the summer. We got up at 6:00 a.m. to grab a spot on the beach to watch the takeoff of Atlantis. After some hunting we managed to find a good spot. But after spreading out the blanket and pillows, we were immediately accosted by some guy who’d got there, along with about 10,000 others, before us. He wanted to set up a table for breakfast in the spot we’d occupied. He then threatened, gently, to run us into the ocean with his SUV. And all of this without telling us what he wanted, which was for us to move. Turns out he did us a favour. We found a much better spot on the beach with more interesting wildlife, like the family of rednecks with their kids with shaved blond Mohawks and a huge stork that started stalking us and seemed all set to carry off our baby. There were the shirtless tattooed guys drinking beer and the Muslim-American families, men in flowered shorts and thong sandals, women in full traditional dress, wrapped head to toe in black cloth. After all of that the launch seemed like a bit of a letdown. Tiny Atlantis was 6 miles away and looked like a distant, elongated burning ball of gasoline on the horizon, and was up and into the clouds in a matter of seconds. And when it was over the crowd, which up until then had seemed kind of surly and self-absorbed, cheered and clapped half-heartedly for a minute or so, and began leaving, clogging up the dual highway. The one-hour drive back to Orlando took three. And that was it. It was all over. Back in the hotel lobby I watched a newly grey-haired Barack Obama addressing his country, telling them there was still no deal on the budget, and a few minutes later a closeup shot of Atlantis lifting off, followed by a rather dismal CNN documentary on the future of the American space mission. Evidently, it’s not much of a mission. Florida’s Space Coast will lose about 9,000 jobs. There are plans to develop a new vehicle by 2016, maybe. But until then American astronauts will be visiting the international space station on Russian Soyuz rockets at something like $62 million a seat. And the real hope for American space travel is the private sector, as in, companies building rockets and charging people, including the government, to send stuff up in space. It all sounds pretty sloppy and unfocused. But I guess it’s to be expected. The real game is back here on earth. By now we all know that there’s nothing much to see in near space. For all practical purposes we’re alone on our little rock. So the investment focus is not on space but on earth: fighting resource wars around the globe, working to keep the U.S. military funded and operational. OK. But have we just witnessed the end of America? Well, we’ve just been to the far end of America—its southern coast—and seen the decline of its dominance in space. As for the rest of the country, it’s certainly different place. Yes, there are more new cars than ever. And there are more self-centred Americans than ever. But I get the sense that there’s a lack of American focus, a drifting sense of hopelessness. The best Americans seem to be able to do now is to settle into two angry camps, the left versus the right. Even addressing the rift between the rich and the poor seems too daunting, now, for this America, in the first stages of visible decline. And how could it be anything other than decline given the steady corporately-fed American diet of junk food, junk media and junk consumerism? Yet, given all this commercial self-indulgence, one might think that Americans are undisciplined. But nothing could be further from the truth. Statisticians faithfully point out that Americans work longer hours and are more productive than, say, their European counterparts. Americans are an extremely disciplined people—who happen to be very good at exporting their corporate and cultural models to the rest of the world. So the reasons for America’s decline are more complex than simply blaming overconsumption. America was built on the vision of creating a new society on the frontier. But the frontier, now including space, has disappeared, so Americans are facing the prospect of reinventing their own mythology as they become a mature culture. And therein lies the difficulty. Where can America turn for new models? A look at past empires could provide some guidance. England today has a culture and an economy (based largely on services and finance) that closely resembles the new American direction. Today, post-empire Europe has a very different approach to the future, one that includes technical excellence, ecological concern and energy security as fundamental targets for the future. The most significant challenge to America will be re-envisioning its role in the world, not as the global leader, but as a cooperative global participant in the world community. 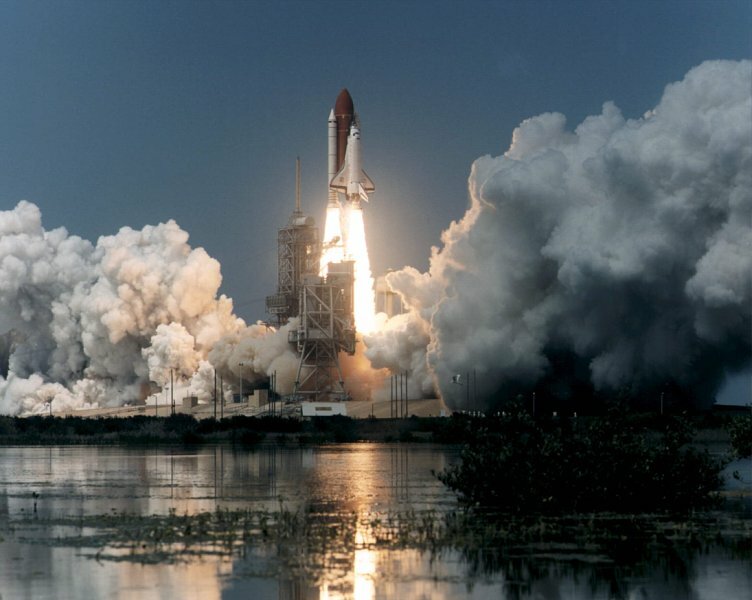 The end of the shuttle program may just be the beginning of that process. Failing that, the country with the frontier myth desperately needs to discover its next frontier. "And how could it be anything other than decline given the steady corporately-fed American diet of junk food, junk media and junk consumerism?" Don't forget the junk science and junk politics. And the junk politics is very likely the worst part of it. Hey, thanks Paul. Hope our trip has the same positive effect on our boys. Trust your summer on the boat is going well! Come now gentlemen, such pessimism! The U.S. has reinvented itself over our relatively brief history as a nation on more than one occasion. Grabbing an idealized notion of freedom and equality from a war that was hard fought with a greater power(yes, a lot of the rhetoric was hypocritical in application but real in the heart behind it). Rebuilding a country out of a civil war that should have left us permanently in ruins. Surviving the Dust Bowl,the advancement of women's rights,the Great Depression and the turbulent civil rights era. Survived WWI, WWII, the Korean War, Vietnam and the myriad of other conflicts that left us tattered but not done for. "It was the best of times; it was the worst of times." (Dickens) The opening lines of A Tale of Two Cities seem as apropos to the 21st century U.S. as it was to 18th century France. It's the end of an era but not the end of country. If you don't believe me, go to YouTube and find a video of Gloria Gaynor singing I Will Survive. It's America's unofficial theme song. Yes, Sheria. But unlike other recoveries, what if this time the nation is unable to identify or deal with the actual underlying problems (e.g. "simple" things such as the migration of wealth to the top and the inability to raise taxes...or deal with environmental degradation and resource depletion)? You've written a travelogue/time capsule for the summer of 2011, the sort of thing that a lucky great grand-child might run across when trying to learn more about a by-gone age for a history assignment.
" England today has a culture and an economy (based largely on services and finance) that closely resembles the new American direction. Today, post-empire Europe has a very different approach to the future, one that includes technical excellence, ecological concern and energy security as fundamental targets for the future." While they struggle with their Euro-experiment and I worry for that, I do find much to admire in the British and European attitudes. They know they are not the center of the globe, but they intend to remain viable and make superior contributions to the future. There is dignity in that and we could so use some dignity. Thank you for this good piece! Thanks Nance. I really agree: there is dignity in making superior contributions to the future without being the centre of the globe. America will have to face a psychological shift soon, moving from one cultural paradigm to the next. A worrisome thought is avoidance or denial. For example, the 2010 movie "Inside Job," which outlines the recent financial collapse mentions that, for the first time in history, American children are now less well educated than their parents. That's not a transition; that's a decline.